Assisting in both DNA synthesis and detoxification L-Arginine is a conditionally essential basic amino acid involved primarily in urea metabolism and excretion. 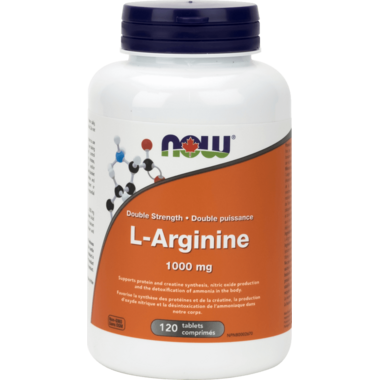 L-Arginine is the substrate for the synthesis of nitric oxide (NO), a cell-derived relaxing factor that is essential for regulating vascular tone and blood flow. It also supports the manufacture of creatine, an energy substrate for muscles. 95% of creatine is located in the skeletal muscle. This is the double-strength formula. I take the NOW Foods brand of L-Arginine regularly and the price here is very good compared to my local shops. Great product. Very happy with the quality and price. The customer service is the best I have experienced with an online site! I plan to order more products in the future.